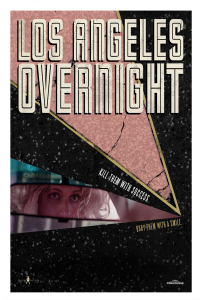 After years of futile struggle, would-be-famous actress PRISCILLA ANDERS heads for a bitter end to her stay in L.A., until one fateful morning at the diner where she waitresses. Overhearing a bizarre riddle bespoke by some seedy regulars, Priscilla soon finds herself in the role of femme fatale, recruiting the lovelorn mechanic BENNY to follow the riddle to its nightmarish end. The pair loots a host of colorful-yet-dangerous criminals of the cash Priscilla needs to fund her Hollywood ambitions, but the pursuit of the cash is immediate, hot, and blood-soaked.